"Safest way through is fast." Attend either of these events, and you'll find some of the game's coolest prizes at stake—so bring your A-game and expect to face bleeding-edge tech and strategies! 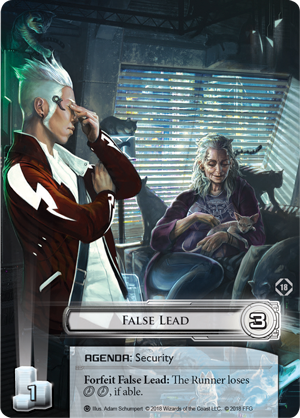 Attend either the 2018 Android: Netrunner European or North American Championship, and will find yourself holding a new, alternate art version of the False Lead agenda. Sure, it's never good to get caught making a wrong turn—but it's immensely satisfying to trick your opponent into wasting a couple invaluable clicks. And it's even better when those clicks lead your opponent away from your central servers and into a run-down, cat-infested apartment—a scene realized by the talents of artist Adam Schumpert! The mind is a terrible thing to lose. Or so they say. But the set of acrylic brain damage tokens you claim for making the Day 2 cut will certainly take a bit of the sting out of your losses. Crack the Top 64 at either the European or North American Championship tournament, and you'll access a special, double-sided identity card. Printed on frosted plastic and spot-glossed, this card features the popular Haas-Bioroid ID Cerebral Imaging on one side and the Angel of Cayambe, Valencia Estevez, on the other. Flatline some runners. Advance your agendas. Earn a promotion. If you can work your way into the Top 32, you'll receive a commemorative binder that will stand testament to your performance, even as it helps you sort and store all the other prizes you've received. 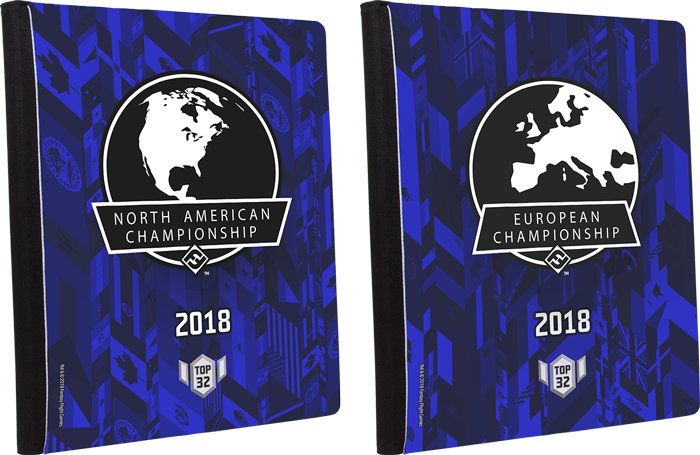 Proudly displaying either the European Championship or North American Championship logo atop a blue background layered with the appropriate flags, this binder holds nine standard-sized cards per page and up to 360 cards total—perfect for Android: Netrunner. An elastic fastener wraps over the back to keep it shut securely. 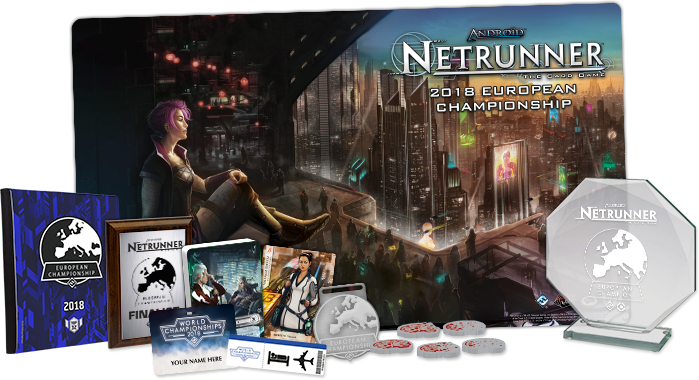 The Top 16 participants at the Android: Netrunner European Championship and North American Championship will receive a medal bearing the event's logo. A new battlefield awaits all those who play their way into the Top 8. 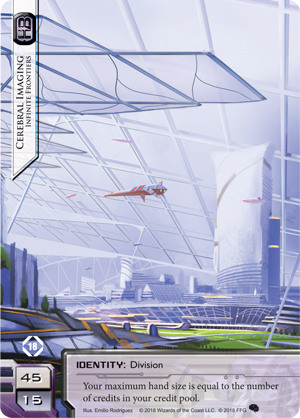 With artwork from the Reign and Reverie deluxe expansion, the Top 8 playmat carries your games (in spirit, at least) to the ChiLo grid, where nearly every district is ruled by a different kingpin. Not only does this playmat offer a convenient surface for your games, but it might just inspire you to work a little harder, push some more code, and topple the kingpins from their roosts! To make the Top 4 at the European and North American Championships, you'll have to face all manner of cyberstruggles. You'll have outraced some runners. You'll have avoided corporate ambushes and hitmen. You'll have called your opponents' bluffs. You'll have bluffed your opponents. 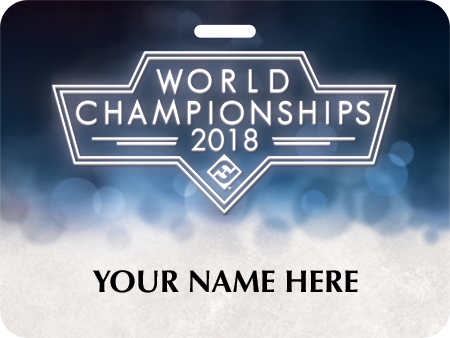 And we'll hope to see you competing for the game's top honors at the 2018 Android: Netrunner World Championships! 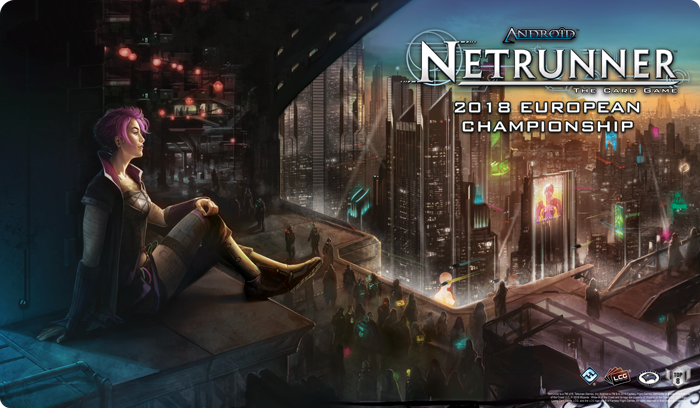 For their efforts, each of the Top 4 players at the 2018 Android: Netrunner European and North American Championships will earn a free event ticket for the 2018 Android: Netrunner World Championships. The best runners and sysops frequently work in corners of the network that others can't access. And anywhere that these runners and sysops can't access? They gain access, by hook or by crook. They tinker with their breakers. They network with the right people to gain new levels of clearance. And in the end, they make things happen—things that drive the bleeding edge forward, making possible what hadn't even been envisioned. 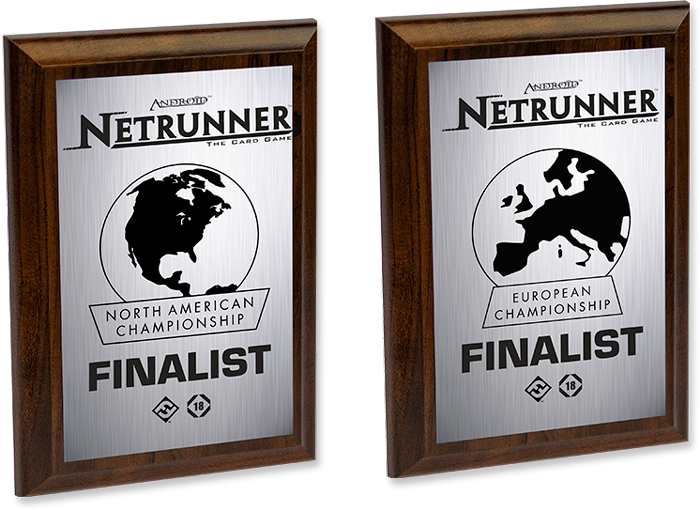 If you are one of these individuals, you may find your way to the top of either the 2018 Android: Netrunner European or North American Championships. 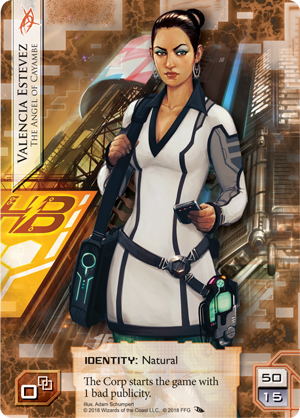 And if you do, you'll get a shiny new trophy and a flight and lodging to the 2018 Android: Netrunner World Championship! Your victory will also see you slip right past the event's outermost ice—with a first-round Prize Bye—and you'll earn a free event ticket for a guest of your choice. 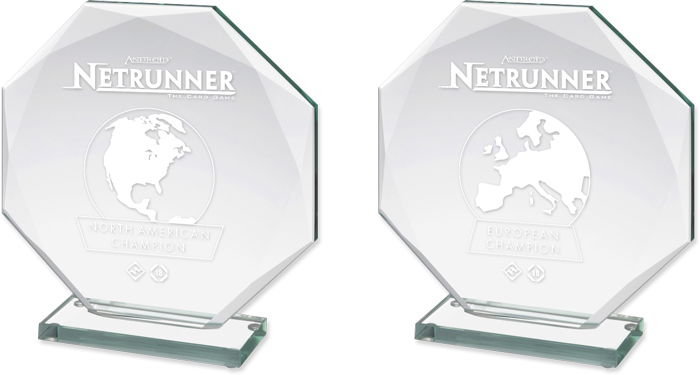 The prizes at the 2018 Android: Netrunner European and North American Championships will soon be up for grabs. The corporate ice is weak, so if you want these prizes, you'll just have to outfox the other runners. But, of course, you can't access if you don't jack in, so be sure to check out the event info today for these top-level competitions at UK Games Expo and Gen Con Indy!